David Crowder Band was one of the most iconic, popular and well-known contemporary Christian bands of their time. That’s why when it was announced they would be splitting up and frontman David Crowder would be going solo, it took a lot of fans by surprise. After the band’s massive fanbase got past the fact that the band was going their separate ways, speculation and curiosity peaked about what the upcoming David Crowder solo project would be. Enter 2014 and David Crowder is finally ready to release his solo debut, Neon Steeple, under the name Crowder and it features a sound that may take a lot of fans by surprise. While David Crowder Band was known for their praise and worship style of music, Crowder goes in another musical direction, featuring more of a bluegrass worship sound. Songs like “I Am,” which was on the latest Passion record, as well as “Come As You Are,” feature the classic David Crowder sound and style, the vast majority of the record takes a southern bluegrass approach. If you were to walk into a small country church in the Heartland, the worship music you would hear is very similar to what is contained on Neon Steeple. “Hands of Love” takes yet another approach in somewhat of an electronic techno worship style you might hear on a modern-day Newsboys record but it too also goes into the bluegrass sound when the song gets going. If there was ever a genre for techno-bluegrass-worship, this song would fit perfectly. Then there’s “My Sweet Lord,” which features a duet with Emmylou Harris, which shows the softer side of Crowder’s solo effort and will calm you powerfully. 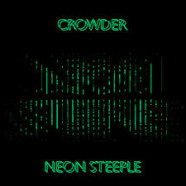 Neon Steeple, while a new musical direction and horizon for Crowder should be an instant hit with fans and it won’t be long until worship teams everywhere are using some of the songs for their own services, much like they have with many of Crowder’s songs in the past.